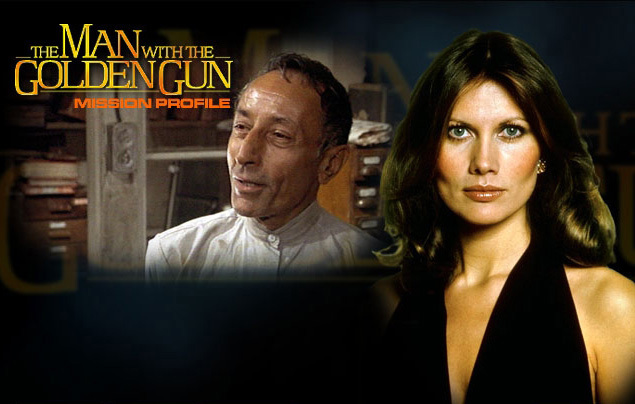 Assassin Francisco Scaramanga, known as "The Man With The Golden Gun", has stolen a device which will allow him to control solar power for criminal purposes. 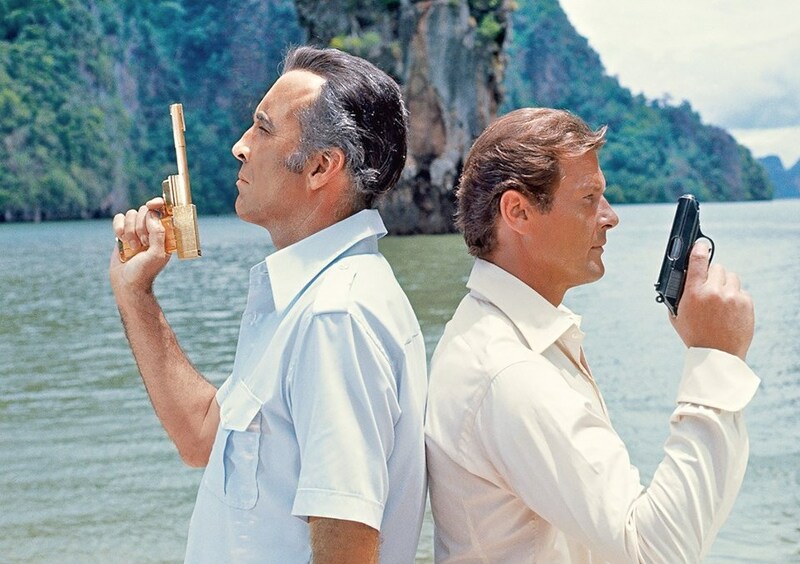 Bond is assigned to stop him, but Scaramanga's Golden Gun has 007 in its sight. J.W. 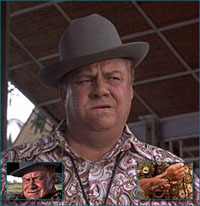 Pepper Clifton James Gör sin andra Bond-film som sheriff Pepper. Sir Christopher Lee dies at 93 - "The Man With The Golden Gun"
James Bond-museet utökar med raritet En raritet från "Mannen med den gyllene pistolen" har donerats till James Bond-museet. Goodnight is Bond's beautiful but inept contact in the Far East and is more of a comic relief than a true Bond girl. Britt Ekland was first offered the role of Scaramanga's girlfriend but the producers changed their mind when they saw her in a bikini. ENGLAND - 14 Oktober 1927. 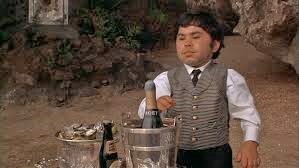 Nick Nack is Fransisco Scaramanga's diminutive assistant who gets thrills from trying to use others to eliminate his boss. 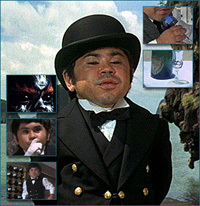 Nick Nack is the controller of the man with the golden gun's play house -- he knows that when his master dies, he will become the heir of the estate. A hick sheriff from Louisiana, Pepper first met Bond in Live and Let Die while Bond was escaping from Kananga's henchmen by motorboat. 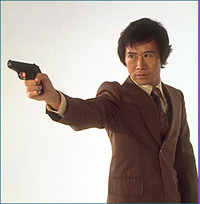 JW serves as comic relief in The Man With The Golden Gun. He really isn't an ally, so to speak. 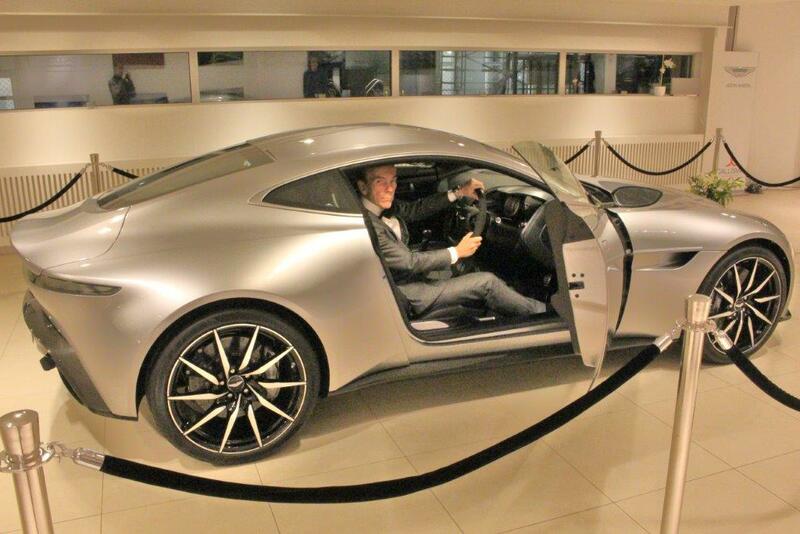 Instead, he serves as one of Bond's contacts. 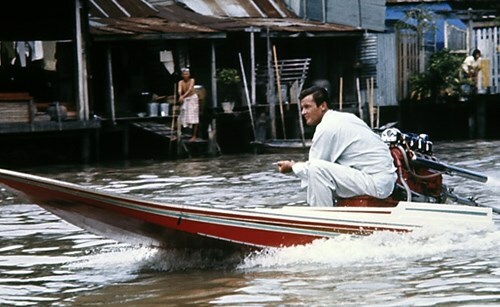 Hip is the Hong Kong police officer assigned to work with Bond to recover the Solex Agitator. 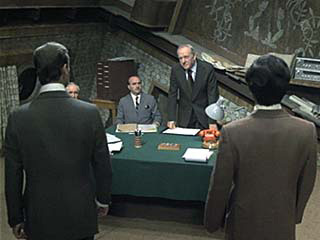 When he pretends to arrest Bond following the assassination of Gibson, he inexplicably fails to tell 007 that he is actually bringing him to a meeting with M, thus causing Bond to have to initiate an escape. Later, after he and Bond flee Hai Fat's henchmen, Hip speeds away in his car leaving Bond behind in the dust to fend for himself. Hipe later suffers the indignity of disguising himself as a peanut vendor at a boxing stadium. Although he succeeds in recovering the Agitator, Hip makes the mistake of entrusting it to Mary Goodnight. 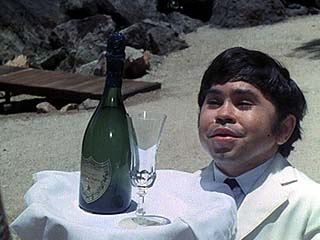 The Man with the Golden Gun: Dom Pérignon '64 (Bond says he prefers the '62) and Moet Chandon in opening scene. 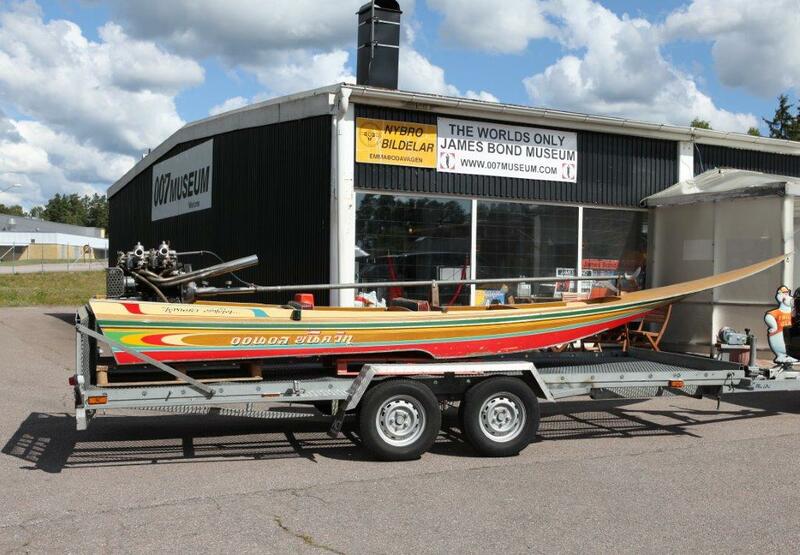 Denna årgången får Bond serverat av Nick Nack på ön til Scarmanga i The Man with the Golden Gun. 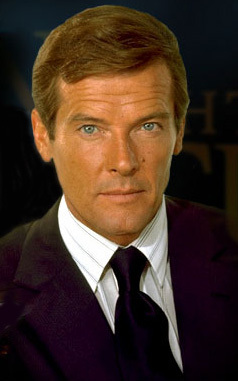 007 helst föredrar '62-årgangen. 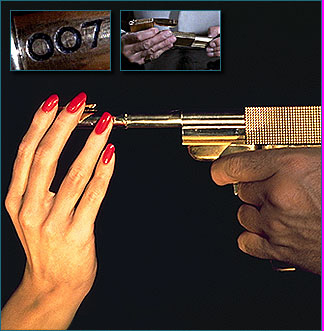 Golden Gun pistol 007 bullet. (Roger Moore) James Bond (Britt Ekland) Mary Goodnight in bed action. The head of MI6, M gives Bond his assignments and is the only person 007 answers to. 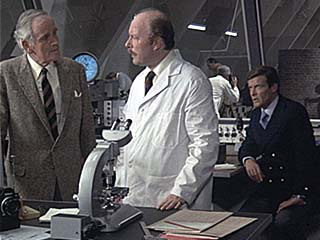 This M in particular, Bernard Lee, first appeared in Dr. No and featured in every other one up to Moonraker when he died shortly after filming. A bronze AMC Madator owned by Scaramanga, which had the additional feature of a detachable wing/jet engine module which attached to the roof of the car, giving it more than just the ultimate driving pleasure. The vehicle which left both Bond and JW Pepper with their jaws hanging open. 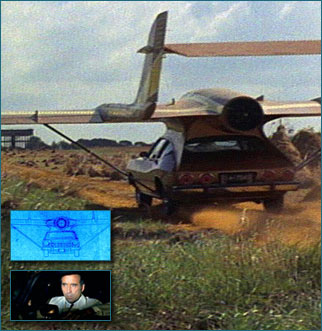 After a high speed pursuit by Bond, Scaramanga drove his car into an old warehouse and attached the wing module to the roof. 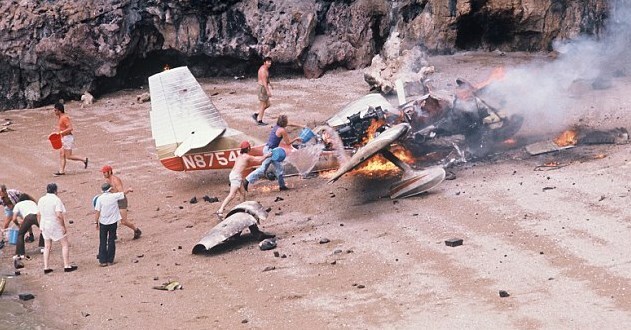 As Bond and Pepper attempted to break into the warehouse, Scaramanga drove down the "runway" and jet-setted into the air and over the heads of James Bond and JW Pepper, who gasped in amazement. 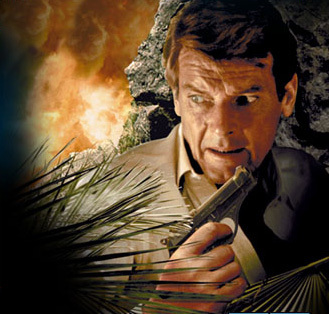 Locations: London to Beirut Libanon, the Macau- Hong Kong- Bangkok, Thailand - Scaramanga's base was actually a volcanic rock island called Khow-Ping-Kan in the Phang Nga Bay of Thailand. Nick Nack serves him Guinness and Moet Chandon to make a “Black Velvet“. 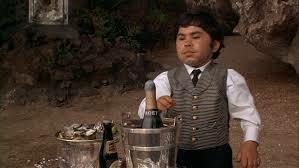 “ Black Velvet”, Francisco Scaramanga's choice of drink is simply ... soft drink. The Solex was inspired by the energy crisis of the 70's. 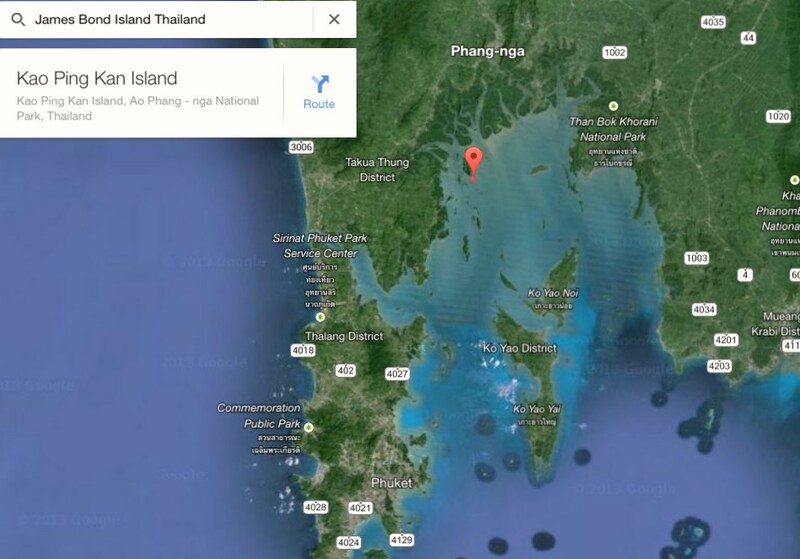 Scaramanga's base was actually a volcanic rock island called Khow-Ping-Kan in the Phang Nga Bay of Thailand. Christopher Lee is the cousin of Ian Fleming. Britt Ekland, real name Eklund, is the ex-wife of Peter Sellers who starred in the spoof of Casino Royale. Britt Ekland was pregnant during the shooting. Felix Leiter is a main character in the book version, yet he does not make an appearance in the film version. 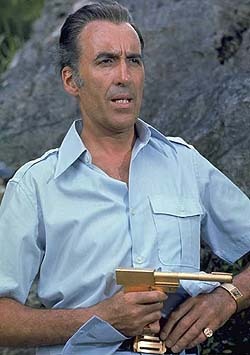 The name Scaramanga came from a Greek man Fleming knew named Pandia Scaramanga whom he met on the island of Hydra and in whose island house he stayed in. Fleming actually asked permission to use the name, letting him know that he would be a villain. 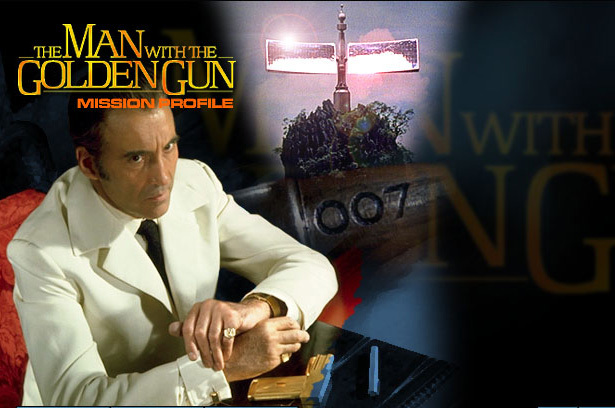 Mr. Scaramanga, being a superstitious man, replied: "I certainly do not mind your using my name but please do not to kill me." The scene where Scaramanga and 007 stand back-to-back, with their guns drawn, is a reference to the John Wayne western The Comancheros (1961). The only difference was that Nick Nack counts to 20, instead of 10. When Bond finds Andrea Anders in the shower, the reflection of a crew member can be seen in the mirror's reflection. Paul & Linda McCartney blev nominerade både till en Oscar och en Grammy för sin titellåt. 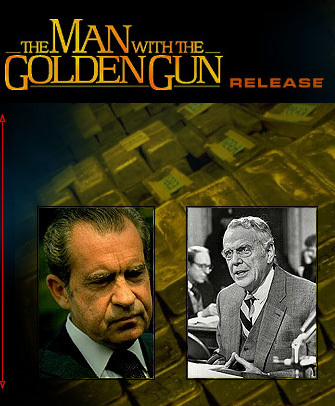 Filmen fick den det tyska Golden Screen-priset. 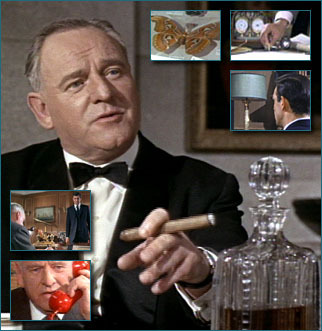 Scenen då Bond hängflyger från en båt och till Solitaire's hus var från början en scen som togs bort från manuset till den tidigare Bondfilmen, 'Diamantfeber'. Manusförfattaren Tom Mankiewicz (som även var med att skriva det manuset) tyckte om den scenen så mycket att han tidigt lade in den i denna filmen. Under båtjakten, så hoppar ju Bond över en väg. Visst, allt gick fint och sen skulle den efterföljande båten göra likadant, men då gick det inte lika bra, utan båten kraschade med polisbilen på vägen. Detta var inte meningen, men då det hände medan de spelade in det, skrev de om manuset och satte in scenen i filmen. Colibri takes the lighter to the next level in great design and variety, without compromising fine, functional craftsmanship. In 1928, Colibri introduced the world’s first automatic lighter. It was an immediate success and the first of a host of innovative products that would secure Colibri’s position as the leader in lighter technology. Eighty years on, Colibri continues to lead the way with beam sensor, cigar, sport and multi-function lighters, along with a wide selection of impeccably styled and detailed smoking accessories. 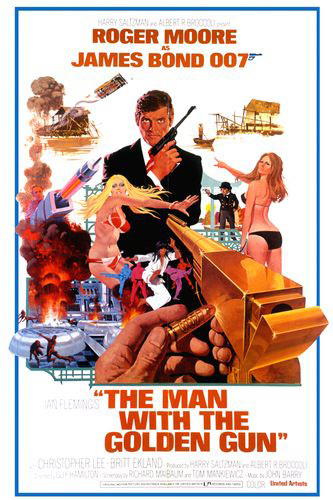 “The Man With The Golden Gun”. 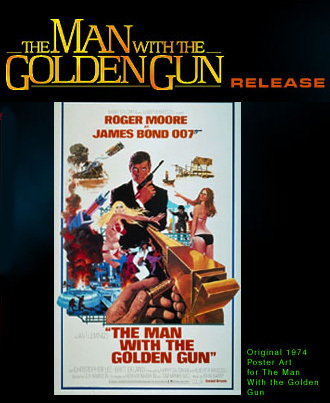 In 1974, the famous ‘Golden Gun’ in the James Bond classic The Man With The Golden Gun starring Roger Moore was made by Colibri. 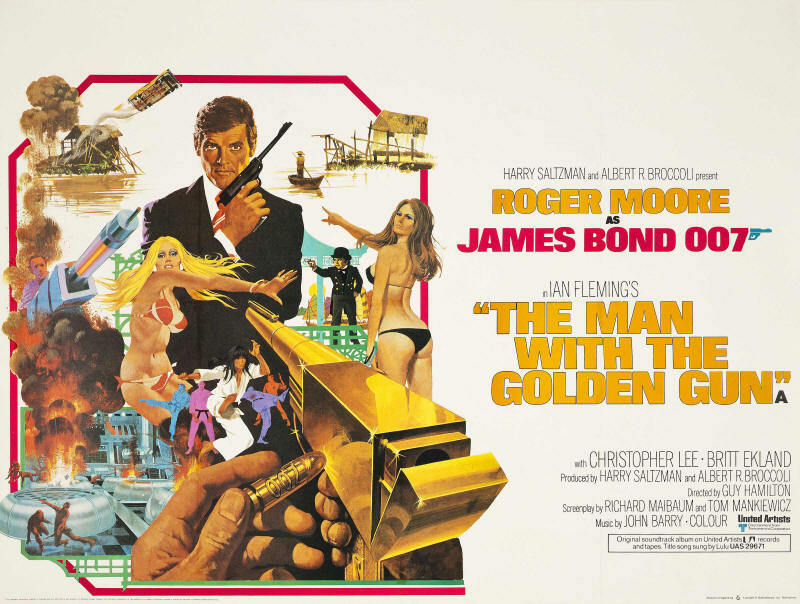 In Fleming’s novel, the golden gun is a gold-plated .45 calibre revolver; however, for the film, it was a single-shot weapon that fires a custom made 4.2-millimeter golden bullet. 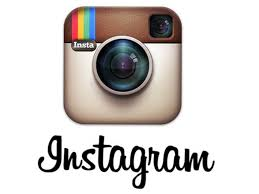 The instant kill technology relies on the bullet shattering akin to a fragmentation grenade. 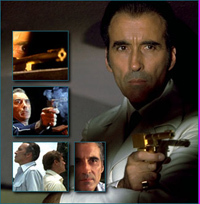 Scaramanga uses such a weapon to emphasize his peerless skill as a pistol marksman and the fact that he only ever needs one bullet to kill a target. 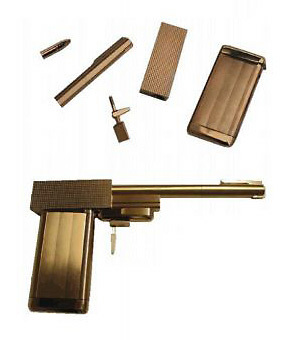 The gun also separates into a gold cigarette lighter, a gold cigarette case, a gold cuff link, and a gold pen so as to avoid detection. Every Colibri product is individually inspected to ensure it conforms to a rigid quality control standard and each product is back by a worldwide one-year repair service warranty. 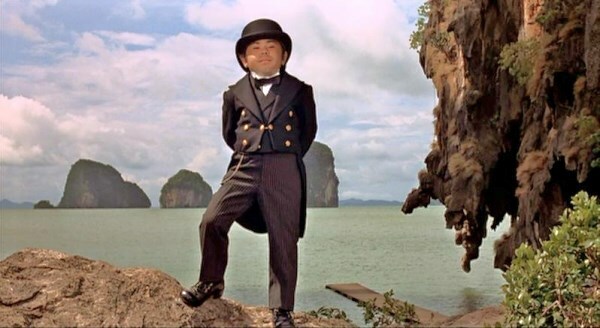 Nick Nack Thailand - Scaramanga's base was actually a volcanic rock island called Khow-Ping-Kan in the Phang Nga Bay of Thailand. 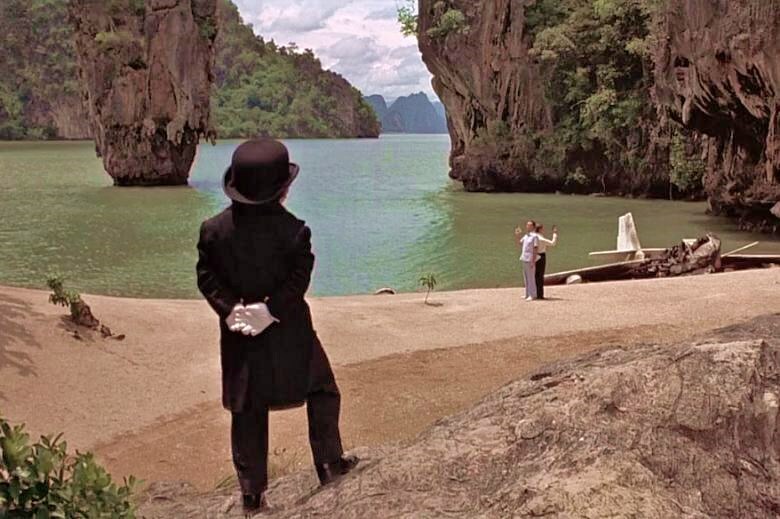 Scene Bond flies over Phang Nga Bay on his way to hitman Scaramanga's island hideaway on Ko Tapu, now known as James Bond Island. 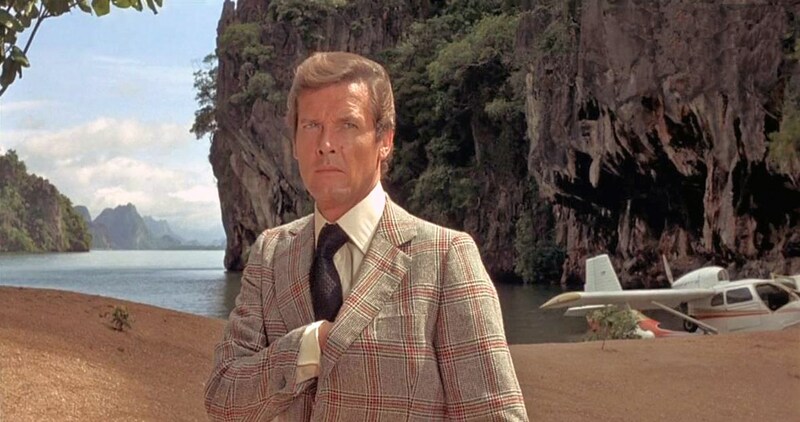 Here, Scaramanga shows Bond his solar power plant hidden in the rocks, destroys his plane, sits down for lunch with him and then suggests a duel on the beach, which he walks away from. 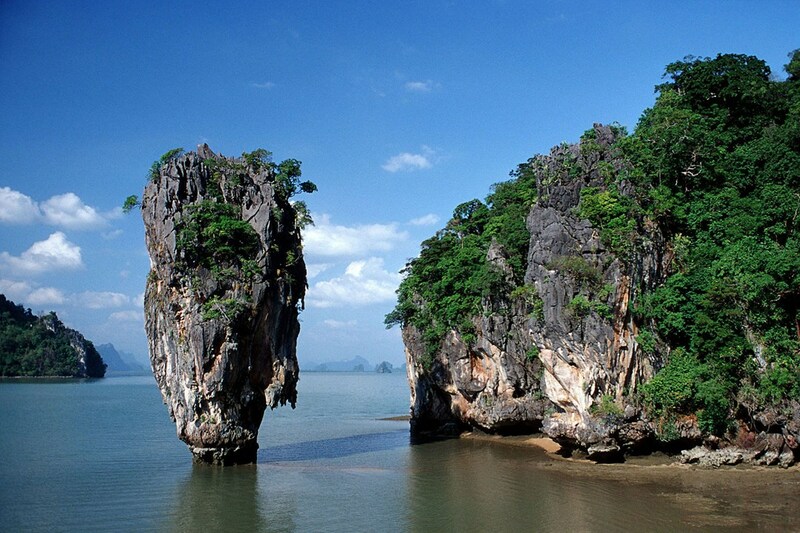 Thailand - Scaramanga's base was actually a volcanic rock island called Khow-Ping-Kan in the Phang Nga Bay of Thailand. On Koh Yao Noi, Six Senses Yao Noi Beyond Phuket has excellent leisure facilities - a must for properly exploring Phang Nga Bay - and can arrange helicopter trips for James Bond-style views.